Loudspeakers have been with us for a long time — but there’s still room for innovation, as these exemplary new Geithain models prove! One of the fascinations of speakers for me is that, despite the basic technology of the moving-coil driver being, well, let’s say, ‘mature’, there’s still no shortage of designers and manufacturers inventing different ways to deploy it. There’s a parallel, I guess, in automotive design and its continued reinvention of four wheels and an internal combustion engine. One fundamental reason I reckon is behind this continual re-imagining of moving-coil-based speakers is that the multi-disciplinary nature of their design, which partly arises due to their role as a transducer, means that their engineering challenge is unusually rich in possible solutions. 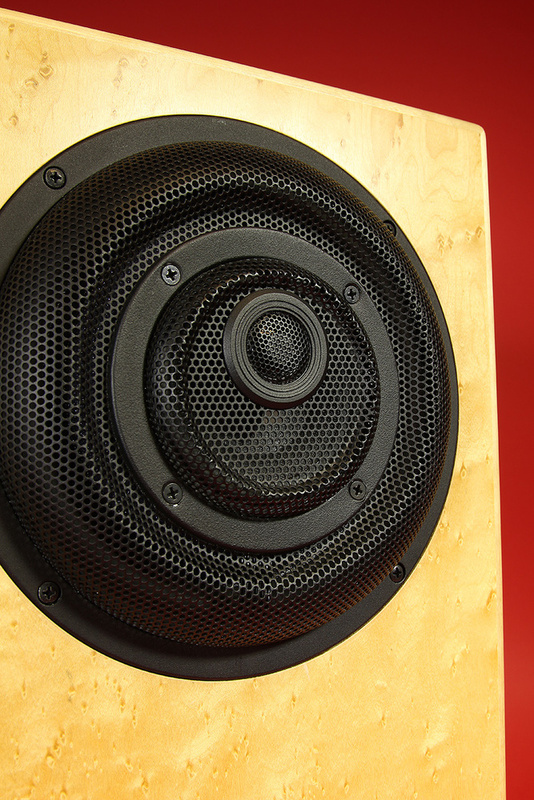 Of course, many speaker designers and manufacturers find themselves inexorably drawn towards conventional and somewhat formulaic solutions to the problem — driven partly, perhaps, by the received ‘wisdom’ of inherently risk-averse sales and marketing departments — the preponderance of identikit two-way, reflex-loaded active monitors being the blindingly obvious example of that phenomenon. But there are, thankfully, still a bunch of speaker manufacturers that plough particularly individual furrows and come up with monitors that are not just a bit different, they’re a lot different. And that, by way of a suitably un-formulaic introduction, is why I’m genuinely intrigued by the subject of this review: the somewhat otherworldly Geithain RL944K. I mentioned a couple of reviews back that I feel we in the UK have a slight blind spot when it comes to European speaker manufacturers. Geithain is perhaps another example our myopia. The company, originally founded in East Germany, have a history extending back to the service of watches and broadcast electronics in the early 1960s. 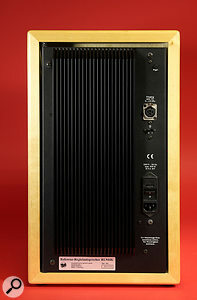 In-house-designed mic amplifiers were introduced in 1967 and joined by power amplifiers in 1970. The highly successful cooperative of 30 employees were compulsorily nationalised in 1972 and, along with manufacturing a range of electronic organs, introduced their first stand-alone speaker system in 1980. Following the reunification of East and West Germany in 1990, Geithain became a privately owned company and have grown ever since, still with their founder Joachim Kiesler at the helm. Geithain have carved themselves a position of preeminence, particularly in the German TV and radio broadcast sector. The full Geithian product range is extensive and reaches from compact desktop-style speakers right up to main monitors. At over £8000$10k per pair, the RL944K is a technically ambitious speaker that inhabits a position in the range towards the upper middle and, most interestingly from a reviewer’s point of view, employs the full-monty of the less conventional Geithain bespoke technologies. 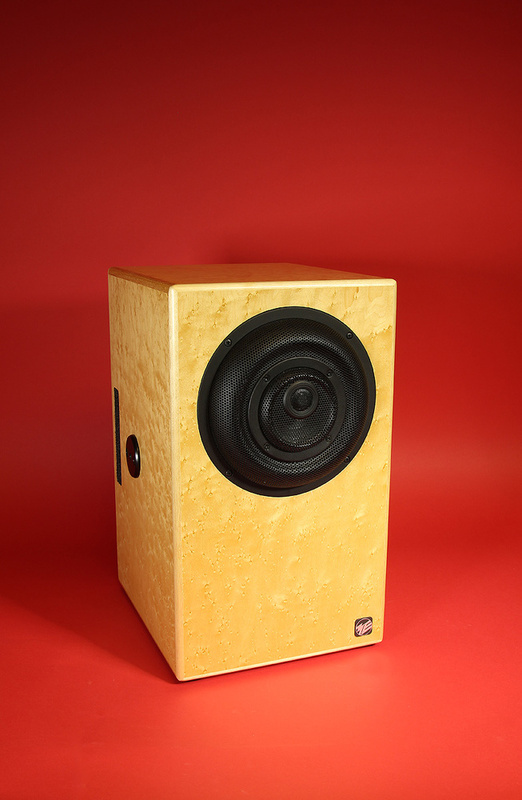 It is relatively compact (although to describe it as ‘small’ would be just plain wrong) and, Geithain say, is specifically intended for use in small studio spaces where listening distances are restricted. In contrast to its unconventional elements the RL944K steers not too far from the conventional with its rear-mounted amplifier and heatsink module. The three amplifiers are specified at 180 Watts for the bass driver and 100 Watts each for the mid-range driver and tweeter. A single balanced input is provided with, that pet hate of mine, screwdriver-adjustable rather than switchable gain. 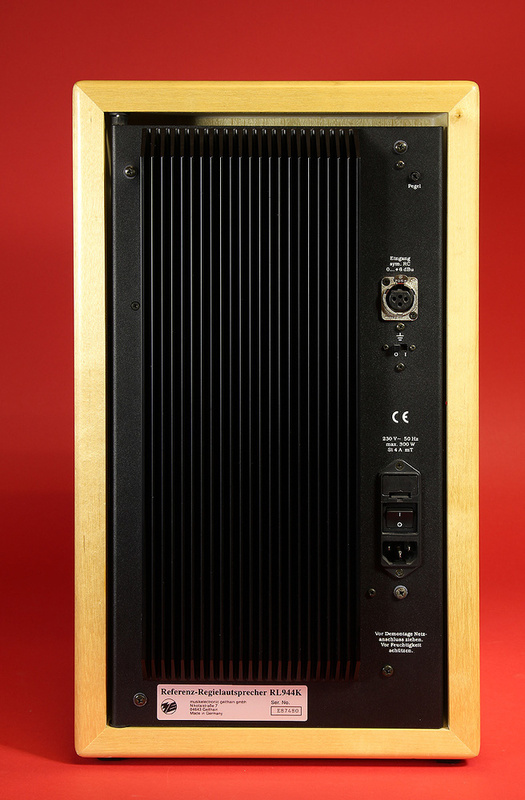 Those technologies I mentioned include a three-way concentric driver array, which Geithain call MCDS-Coax, and an equally unusual enclosure technique called K-Technology that Geithian claim endows the speaker with a cardioid radiation characteristic at low frequencies. Now, while the means to achieve a concentric driver array is self evident (the drivers are simply mounted in front of one another, requiring relatively little description — though that won’t stop me), a claim of low-frequency cardioid dispersion is no small deal and needs some explanation and teasing apart. So that’s where I’ll start. By its very nature, low-frequency sound energy is not easy to manipulate. The wavelength of sound at, say, 55Hz (open A on a bass guitar) is over 6m, and sound waves of that size don’t lend themselves to being bossed about by speaker engineers. Long wavelengths propagate just where they damn-well want, which is usually everywhere. It’s a simple matter of dimensions: nearfield monitor bass-driver diaphragms are typically somewhere between 0.15 and 0.25 m in diameter, so wavelengths of significantly greater dimensions diffract around the diaphragm and propagate omnidirectionally. Actually, that’s only true of drivers mounted in an enclosure. A driver without an enclosure fundamentally operates as a dipole, although, again, at frequencies where the wavelength is greater than the diameter of the diaphragm, the output from one side of the diaphragm simply cancels the reverse-polarity output from the other side. This is the fundamental reason why an enclosure is required at all: to isolate the driver’s front and rear radiation at frequencies where they would otherwise cancel. So, how have Geithain managed to create a speaker system with non-omnidirectional, low-frequency dispersion? Well in effect, they’ve made the enclosure leak. On each side of the Geithain RL944K enclosures, towards the rear edge, are mysterious foam-covered slots. These, I believe, are connected internally to acoustically resistive ducting that allow a proportion of the reverse-polarity rear radiation of the bass driver to escape and cancel the forward radiation. The result is a speaker system that demonstrates around 10dB attenuation of backwards radiation at low frequencies. The technique is analogous to the slots sometimes found behind the diaphragm in cardioid microphones. Described in a couple of short sentences, the technique sounds very simple. I’m sure, however, that there’s a great deal more complication involved in making it work in practice. The most fundamental problem I’d expect to face is that creating a purely resistive exit path for acoustic energy out of an enclosure is extremely difficult. If there is any reactive element at all, the ‘leak’ will tend towards behaving like a reflex port, the whole point of which is to reverse the phase of the rear radiation of the driver so that it adds to, rather than cancels, the front radiation — exactly what’s not intended here. Geithain’s approach to driver integration is to mount all three drivers more or less concentrically (the tweeter is displaced slightly in the vertical plane).So, we’re left just accepting that the claims made for K-technology are valid, and certainly the measured dispersion data that Geithain publish looks genuine. But, I can almost hear you ask, why might cardioid characteristics at low frequencies be a good thing? Well, the vast majority of moving-coil-based monitors tend towards cardioid dispersion as frequency rises. Typically, dispersion will begin to diverge from the omnidirectional around the frequency at which the wavelength equates to the dimensions of the speaker’s enclosure, and will continue to narrow as frequency rises. Speaker engineers attempt, some more successfully than others (and most simply hampered by the inherent failings of moving-coil driver technology) to ensure that the narrowing of dispersion as frequency rises occurs gradually and with no sudden discontinuities. If we all listened to monitors in anechoic chambers, dispersion narrowing with frequency wouldn’t really matter, but of course we listen in reflective rooms where the sound radiated from around the monitor reaches our ears via the walls, floor and ceilings. This means that the tonal balance we perceive is not particularly well represented by, say, a speaker’s on-axis frequency response curve, but by integrating all the energy it fires off into the room, minus the absorption of the room boundaries and its contents. We’ve all experienced the huge variation in bass level and character that can occur with different monitor or listening positions, and this is partly due to the typically omnidirectional monitor character at low frequencies. Monitors ‘drive’ the room more at low frequencies than at higher frequencies, where the room is partly taken out of the equation by narrowing dispersion. So a monitor that offers a degree of cardioid character at low frequencies should show both less sensitivity to its room position and less variation of bass performance with listening position. If it works as Geithain claim, with backwards output at least 6dB down, from 30Hz upwards, it should be a good thing. Probably the next best thing to a genuine full-range driver is concentrically arranged multiple drivers, and even though there are some significant technical challenges to be overcome, the relatively few concentric multi-way speakers out there generally demonstrate that the technique can bring significant benefits. The primary benefit refers back to the need for speaker engineers to achieve a smooth narrowing of dispersion as frequency rises. This is almost impossible with multiple drivers arranged non-concentrically. With concentric drivers a whole raft of driver-integration frequency and time-domain compromises and problems disappear. The few nearfield monitors with concentric drivers that do exist are two-way systems. Three-way concentric speakers of any kind can be counted on very few fingers (three I can definitely recall are all in the hi-fi sector — speakers by Sony, Technics and Cabasse), so Geithain appear to be in pretty exclusive company. However, Geithain’s approach to creating a three-way concentric array of drivers is, in reality, relatively low tech. Rather than fully integrating the different driver elements so that, for example, the tweeter is mounted down at the apex of the bass/mid driver, Geithain’s solution is simply to mount what appear to be relatively conventional drivers (a 200mm bass driver, a 100mm mid-range driver and a 19mm tweeter) one in front of the other. Relatively low tech it may be, but if the crossover frequencies are chosen such that the maximum wavelength radiated from the rearmost driver is long enough that its sound energy diffracts around the physical bulk of the driver in front, there’s no reason why it shouldn’t work. The crossover frequencies on the RL944K are 800Hz from bass to mid-range and 3.8kHz from mid-range to tweeter. At 800Hz the wavelength is around 0.425m, so the mid-range driver obstruction in front of the bass driver, with its diameter of around 0.12m, should be relatively benign. Doing the same analysis for the mid-range/tweeter crossover, the wavelength at 3.8kHz is 0.089m and the diameter of the tweeter body is around 0.042m. So, again, the output from the driver will diffract around the obstruction almost as though it’s not present. The rear panel is somewhat spartan, featuring only a large heatsink, an XLR input, IEC mains inlet, and input-gain trim pot.However, the obstruction issue is not so black and white in practice. There’s a grey area in that, depending on how steep the crossover filter slopes are, the bass and mid-range drivers might have output above their nominal crossover frequencies that could reflect from the obstructions in front to result in subtle coloration. The RL944K crossover filter slopes are a mix of fourth order (24dB/octave) and second order (12dB/octave). The second-order slopes are used on the mid-range filters, so at an octave above the mid-range/tweeter crossover where the mid-range driver output is only 12dB down, the wavelength is approximately equal to the diameter of the tweeter body. In these circumstances, energy from the mid-range driver might feasibly reflect off the back from the tweeter body. One last paragraph of MCDS-Coax description. It might not have escaped your notice, when glancing at the pictures, that the tweeter on the RL944K is not actually located concentrically with the mid-range driver — although it’s probably as close as makes no difference in terms of the basic benefits of the concept. There are three reasons why I think this might be the case. Firstly, it could well be that in removing a symmetry from the arrangement, mid-range reflections from the back of the tweeter are rendered innocuous. Secondly, it may be that the general dispersion profile and driver integration characteristics the designers were aiming for is easier to achieve with a vertically displaced tweeter. Finally, and more prosaically, one of the reasons we don’t perhaps see more concentrically arranged drivers is that UK hi-fi manufacturer KEF Electronics own patents covering some fundamental elements of the idea. One way to circumvent the KEF patents, I understand, is to move the tweeter so that it is not quite concentric with the bass or mid-range driver, so perhaps that is the explanation. So, finally, does K-Technology work? The short answer is, yes, I think it does. I tried the RL944Ks positioned both up against a wall on brackets and on speakers stands out into the room, and their low-frequency balance was very similar in either location. They are notably insensitive to their position relative to a back wall, and along with that, different listening positions seemed to result in less variation in bass level and quality than I am used to. So the bass is consistent, but is it good bass? That’s a yes too. Assuming the RL944K’s enclosure works as I suspect, it will be closer in character to a closed box, or maybe transmission line, than to a reflex-loaded system. It certainly sounds much more like a closed box than a reflex box, with well-defined and tuneful bass that shows little sign of overhang or delay, despite being extended and powerful, although I suspect it helps that there’s less room influence in the mix than would usually be the case. Further on up the range the RL944K reverts to become a more conventional-sounding monitor, but more than just conventional, it’s fundamentally extremely capable too — as you’d have a right to expect from an eight-grand10-grand product. Its basic tonal balance is fundamentally well judged, and in that respect I would have absolutely no problems about using it to produce good mixes that transfer well — although it might take me a little while to re-calibrate some expectations of bass level. And in addition to a satisfying tonal balance the RL944K has that ‘big speaker’ sense of scale, dynamics and detail that comes when a generous manufacturing budget means fewer component compromises have had to be made. It’s really a mid-field monitor masquerading in a nearfield-sized box. It plays satisfyingly loud without losing any of its basic qualities, and quietly too without sounding anaemic. It is revealing of subtle mix details, and fundamentally does all the things we all need our monitors to do. If I have any criticisms they are two, although in the grand scheme of things pretty minor. They fall into the knit-picking category, and if the RL944K were less expensive, I probably wouldn’t give any negatives space on the page. At the elevated price of the RL944K however it seems appropriate to mention any misgivings, however small they may be. Firstly, I found myself very slightly underwhelmed by the character of stereo image that the RL944K creates — it seemed a little left/right-sided without quite the level of focus and depth that I’d expect to hear. Secondly, and this might be the cause of the not entirely satisfying stereo image, I felt the RL944K occasionally has a subtle character, particularly noticeable on simply recorded male voices. A traditional, old-school, hi-fi reviewer might call it a slight ‘boxiness’. It’s a fleeting effect and not audible all the time, but very occasionally it had me pulling a slightly quizzical expression. I’ve ended with a couple of minor negatives, but I hope they don’t colour the entire review because, on the whole, the RL944K is a fine monitor. In fact, especially with its unique low-frequency performance, it’s probably among the best nearfield monitors available. It definitely deserves to be heard and considered along with all the more conventional options. If I was in the market for a monitor and had the budget to accommodate the RL944K it would without a doubt be on my ‘must hear’ list. At its price, the RL944K faces competition from the ATC SCM45A, PSI Audio A25-M, and Barefoot MM27 Gen 2. Very high level of performance and quality. Good dispersion control from concentric drivers. Slight hint of tonal coloration. A technically interesting monitor with one significant, unique and genuinely beneficial feature: cardioid bass. It’s expensive, but among the best. £8176.80. Padded carrying bag £564. Prices are per pair including VAT. $10,179. Padded carrying bag $702. Prices per pair, converted from GBP, excluding tax and shipping.